The Swirl Earrings are set with 3 Rows of White Diamonds. The Diamond weight is 1.97 Carats. All Diamonds are GVS qualities. The earrings have Clip Closing security. 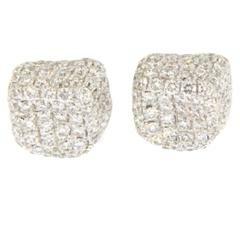 The Earrings are 18K White Gold. Also available in 18 Karat Rose Gold and 18K Yellow Gold.